HP announced the launch of the HP Photosmart 428 Portable Photo Studio, a three-in-one solution offering the ultimate photo simplicity with printer, docking station and camera. Featuring a high quality HP 5.2 megapixel camera and compact photo printer with built in camera dock, this package is the perfect travelling companion - enabling users to print their photos on the go or at home. 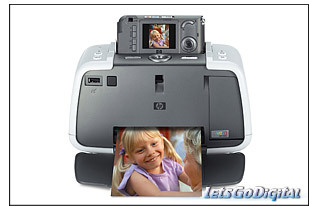 This integrated three-in-one system makes taking and printing photos simpler than ever before. The HP Photosmart 428 Portable Photo Studio, offers users a great solution, in which every component is designed to work together perfectly, providing everything needed to create beautiful photos almost anywhere.